In Fairfax County, local property tax revenue pays for the majority of our public schools. We get very little funding from the state. That same revenue must also pay for other Fairfax County services, including fire and police departments, public health, transportation, parks and recreation / public lands, and more. The Fairfax County Board of Supervisors decides how to fund the public schools and other county services. The Fairfax County School Board can ultimately only request to the County Board the amount of funding it receives – the School Board has no purse strings. Annually, the two Boards do a dance between what FCPS asks for as essential needs and what the County agrees to fund. The truth is, funding from the Fairfax County Board of Supervisors has risen – at the same time that the Fairfax County Public Schools budget requests have risen in response to growing student needs and a rising student population. This means that year after year, the actual needs of students and schools aren’t being met at the level of excellence this county has grown accustomed to – and banked on for real estate values. This occurred from 2008 – 2016. But in 2016, something different happened. #IamFCPS helped parents, educators, and community members advocate for our schools – no more cuts. Fully fund the budget. 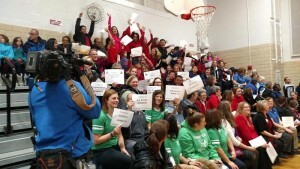 Through generating over 50,000 letters to elected officials, generating crowds to fill public meeting rooms, garnering media coverage on all four local news networks and other press, and raising awareness everywhere, FCPS was not gutted as expected. On July 1, 2016, the Board of Supervisors instituted a tax rate increase that resulted in nearly all of the Superintendent’s budget being funded – but not all: $15 Million was not funded. This was far better than the $75 Million cut originally expected. The monumental effort to advocate for fully funding our schools shined a light on the fact that our only source of revenue is through personal property taxes. So, the County Board of Supervisors proposed instituting another way to raise revenue: through a local Meals Tax. In November 2016, Fairfax County voters voted on whether to add an additional source of revenue that would remove the sole burden from them to fund public education via a Meals Tax. However, this measure failed. The Meals Tax would have raised revenue from an additional source: certain prepared foods, which would be paid not only by residents, but also by commuters and tourists. This would have diversified our local funding, and had people paying pennies at a time rather than asking home owners to undertake a large increase in their real estate property tax. If it was approved, the Meals Tax was estimated to generate approximately $99 Million in the first year – with 28 percent of that amount coming from non-county residents. By law, 70% of the net revenues would have be dedicated to Fairfax County Public Schools. The County Board of Supervisors had no Plan B in place for how to raise revenue if the Meals Tax did not pass. Many residents have wondered that if the revenue of the Meals Tax was so sorely needed, then why wasn’t a back up plan put into place in case the ballot initiative failed? With personal property tax being the only way to raise revenue, Supervisors have not sought to increase such a tax two years in a row. In 2017, the situation was back to the dance of the School Board and County Board deciding how to allocate revenue from personal property taxes. However, the same challenges remained in educating our children – and only continued to grow. Ultimately, the School Board reduced $50 Million from its budget in order to have a budget that equalled the amount of funding the County Board approved for transfer. Click here for a full description of the budget reductions and fees added in FY 2018 (2017-2018 school year). On January 11, 2018, Superintendent Dr. Scott Brabrand presented his proposed budget for FY 2019. Funding teachers and staff is a top budget priority.